This book has been classified as a young adult novella. The protagonist is Princess Madeline and the setting is the medieval kingdom of Soron. Madeline’s mother, Queen Eleanor, is introduced in the Prologue by the wizard Elias and again alluded to in the Epilogue. The subtlety of these allusions will become evident to the reader at the conclusion of the tale. At the beginning of the story, we meet Princess Madeline and her twin brother Braden. They will soon be celebrating their sixteenth birthdays. Madeline’s best friend in Sophia who is a commoner. Alas! She cannot really understand the life of a princess. Sophia is in love with Braden and it seems that her dreams of happiness with him are doomed. King Theodore has attempted to raise his children to be proper heirs of the kingdom, but Madeline is a determined, headstrong and passionate princess who has begun to question her father’s authority. He presents Madeline with a beautiful green gown that was once worn my the mother she never knew. The trouble begins when Madeline learns that the ball to celebrate her birthday is really an opportunity for all the royal suitors to compete for her hand. Enraged by this prospect, Madeline wears another gown in defiance and then feigns illness to escape the ball. This behavior infuriates her father and embarrasses the family. When Madeline is awakened by Sophia the next morning, she learns that there is to be a jousting tournament to determine which of the knights will become her Knight Protector. Her father forces her to attend. She spies a young knight named Daniel who evokes “butterflies in her stomach” and other unexplained emotions in her head. Madeline disappears from her viewing point before the end of the contest. She is determined to escape what she feels is a life in prison. When her disappearance is discovered, all the knights in the kingdom go to search for her. Daniel, especially is determined to win her back. Madeline is clever; she switches her gown with the clothes of a peasant girl that she meets in the forest. She bribes her with a bag of gold coins. But Daniel discovers that the family is hiding the royal dress and finds out that Madeline is still alive. Madeline is alive but she has been captured by bandits in the forest. This young pampered princess has never had to use survival skills, but she is clever and strong. She manages to escape not once but twice. Things are looking gloomy for her; Madeline has learned a few lessons about family, love, and responsibility along her journey. The wizard Elias and his green robed elves make an appearance. Here is where the author successfully merges the fantasy environment with the strong characters and modern day coming of age plot. What will happen to Madeline? Does Daniel win the princess? Will the king and his daughter mend their relationship? This book contains in depth character studies and a story line that moves along well with a few twists and turns. Mature middle grade readers might enjoy the fantasy elements though the plot is more suitable for young adult readers. In fact, I did feel like I was reading a story more intended for an adult audience so my suggested audience would be twelve plus. 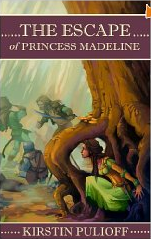 Looking forward to hearing more about Princess Madeline and her life’s journey. If you enjoyed reading this post, please subscribe by clicking on the word Follow or hitting the orange RSS feed button in the upper right hand corner of the post. It’s been a while since I read an MG and I enjoy the odd YA so this will be great. It sounds amazing! I don’t think that you will be disappointed! really like your way of writing a blog. I saved it to my bookmark webpage list and will be checking back soon.